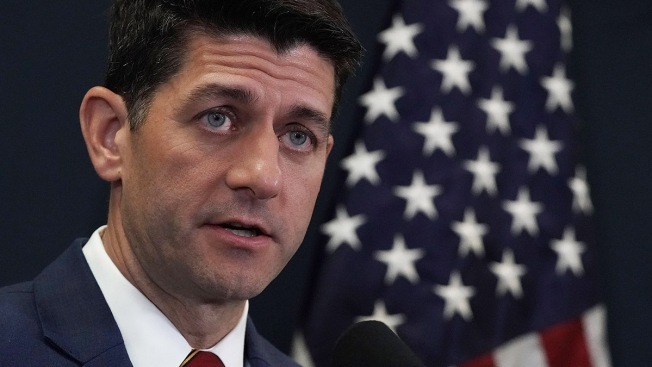 In this file photo, U.S. Speaker of the House Rep. Paul Ryan (R-WI) speaks during a news briefing after a House Republican Conference meeting May 22, 2018 on Capitol Hill in Washington, DC. House Speaker Paul Ryan was surprised and proud to find out he has Jewish roots. The Wisconsin Republican discovered his family history while filming a segment for the upcoming season of the PBS series "Finding Your Roots With Henry Louis Gates Jr."
Gates said Tuesday at a TV critics meeting that he traced Ryan's heritage back to his 10th great-grandfather born in 1531 in Germany. The research showed Ryan is 3 percent Ashkenazi Jewish. "You could have knocked him over with a feather and then he was very proud of it," Gates said of Ryan's reaction. "We don't know who that Jewish person was, but we know it was on his mother's German line, which makes sense. So somebody who was a Christian German slept with a Jewish German person and that's where that came from." Also featured on the show's fifth season debuting in January is Sen. Marco Rubio, R-Florida, and Rep. Tulsi Gabbard, D-Hawaii. Gates said he chose Ryan because he was fascinated by him and not his politics. He picked Rubio because he wanted to include a Cuban and Gabbard because of her Pacific ancestry. "Her genome looks like the rainbow coalition because it's Asian and European and African and it's beautiful," he said. Rubio's history was traced to his fifth great-grandparents born in Italy and on his father's side his seventh great-grandparents born in the Canary Islands, off the northwest coast of Africa. "There was a lot going on politically and in terms of immigration for him," Gates said. Gates' wife, Marial Iglesias Utset, is a Cuban historian and she had her graduate students research Rubio's history in addition to hiring people in Cuba to find his family tree in parish churches. "It was like a challenge, an intellectual challenge for me," Gates said. Gates said his purpose in doing the show is to deconstruct race and show how racism manifests itself in the current anti-immigrant feeling in the United States. "We're all immigrants. We're all mixed up," he said. "When the lights came down, everybody was sleeping with everyone else."